We do a ton of entertaining all year round. But, once the weather gets warm, I like to have people over every chance I can get. Mathlete didn’t spend months building our deck for it not to get used after all. 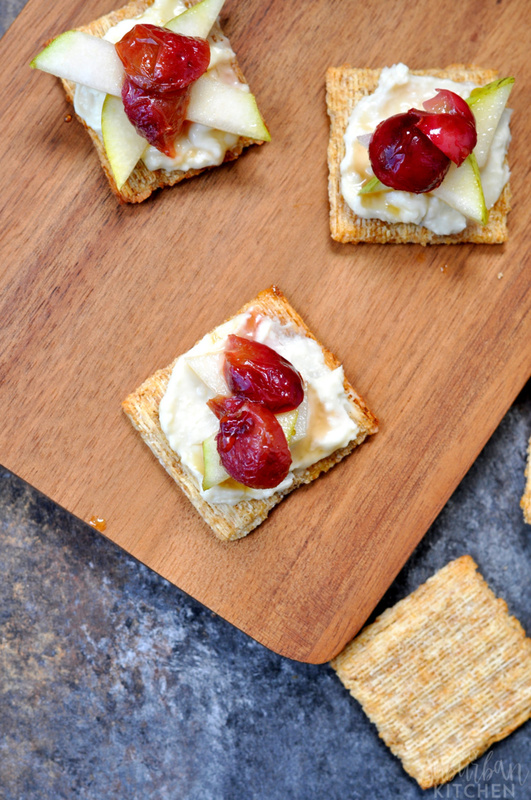 Of course, when we invite people over, we definitely want to have good food options like roasted grape blue cheese crackers, or grapeblucuits as I like to call them! 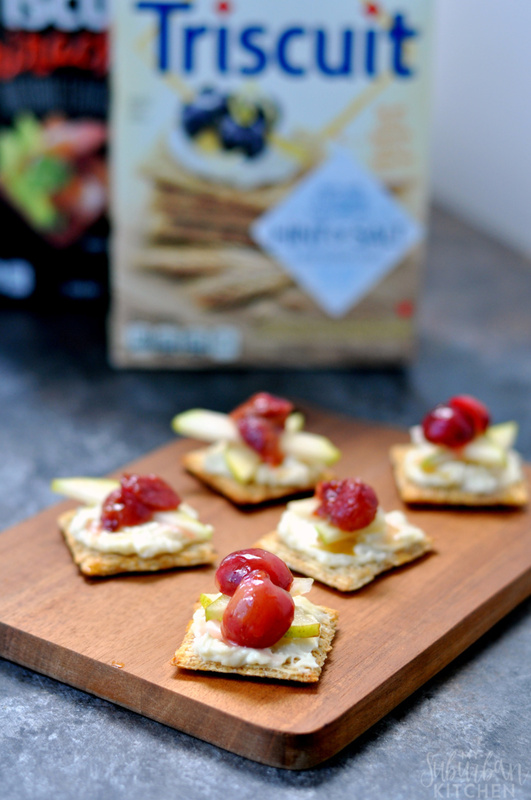 Starting with great items like TRISCUIT Hint of Salt Crackers makes creating little appetizers so quick and easy. I always pick up a few boxes of TRISCUITs from Walmart to keep on hand for impromptu get togethers. Right now, the TRISCUIT Sriracha Crackers are my favorite snack. 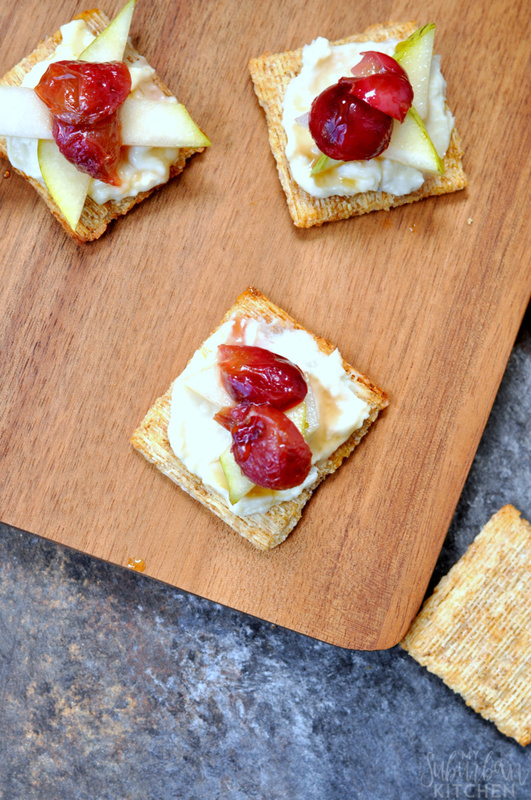 These little appetizers are the perfect combination of fresh fruit with just a hint of salt and delicious blue cheese whipped with honey. 1. Preheat oven to 400 degrees. Line a rimmed baking sheet with nonstick foil. 2. In a small bowl, toss together grapes with olive oil. Place onto prepared baking sheet. Roast for 5 minutes or until skins are blistered. Remove from oven. 3. In a food processor, combine the blue cheese with 1 Tbsp honey. Pulse to combine. 4. 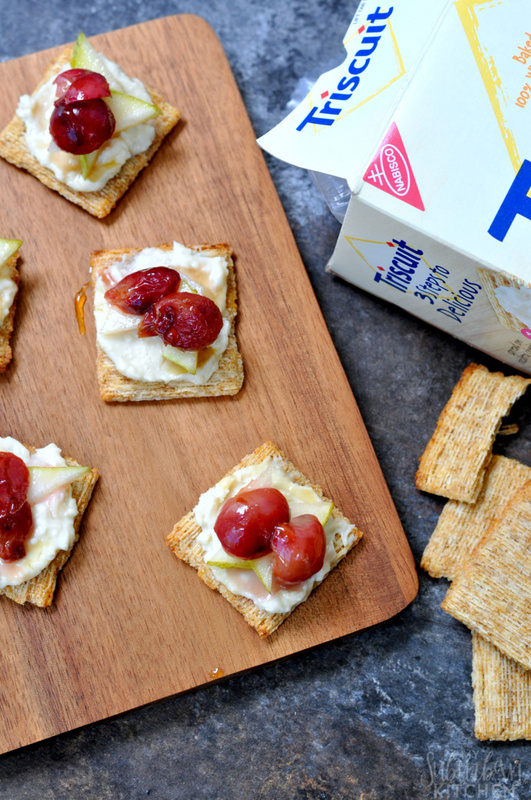 Spread a small amount of blue cheese on top of each TRISCUIT Hint of Salt Cracker. Top with a pear slice and then 1-2 grapes. Drizzle with remaining honey. 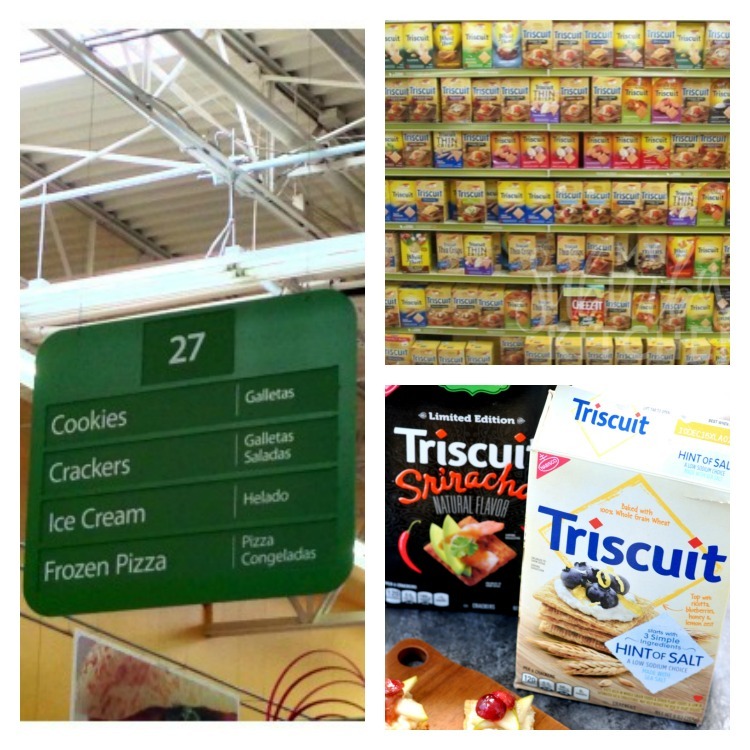 What are your favorite varieties of TRISCUIT crackers? 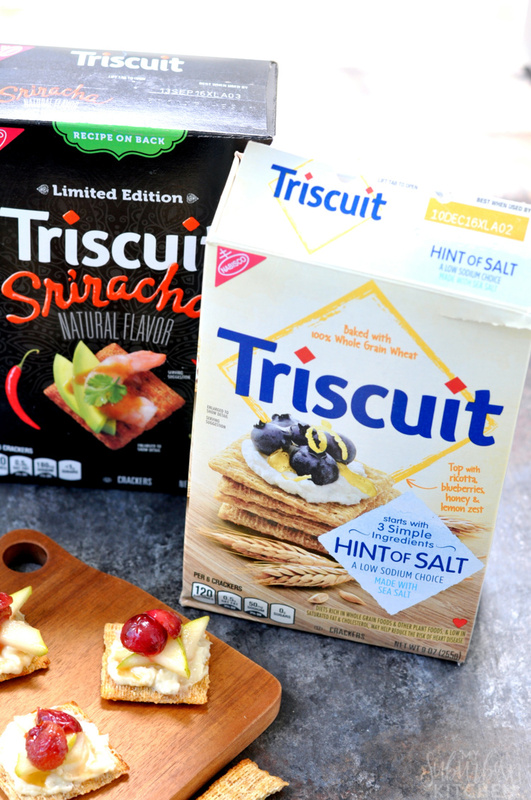 Have you tried some of the new ones like TRISCUIT Sriracha Crackers or TRISCUIT Hint of Salt Crackers. Be sure to visit here for lots of great inspiration. Preheat oven to 400 degrees. Line a rimmed baking sheet with nonstick foil. In a small bowl, toss together grapes with olive oil. Place onto prepared baking sheet. Roast for 5 minutes or until skins are blistered. Remove from oven. In a food processor, combine the blue cheese with 1 Tbsp honey. Pulse to combine. 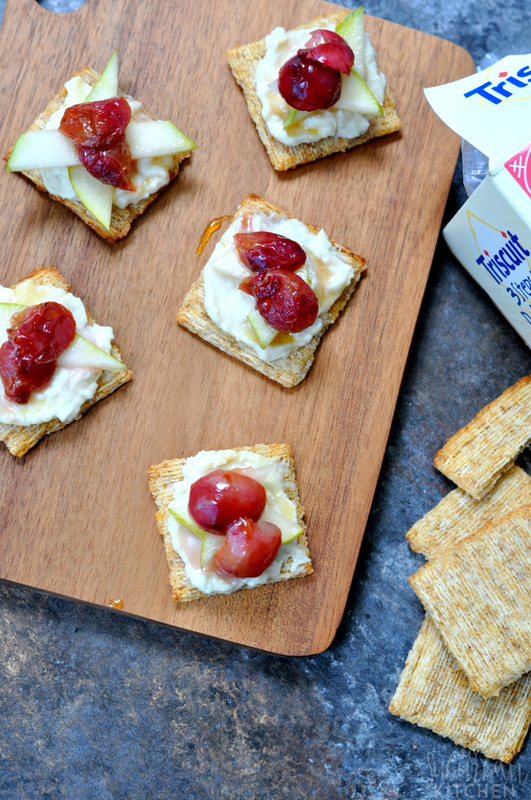 Spread a small amount of blue cheese on top of each TRISCUIT Hint of Salt Cracker. Top with a pear slice and then 1-2 grapes. Drizzle with remaining honey. A perfect party appetizer! Thanks for sharing on the What’s for Dinner link up! Great apps! 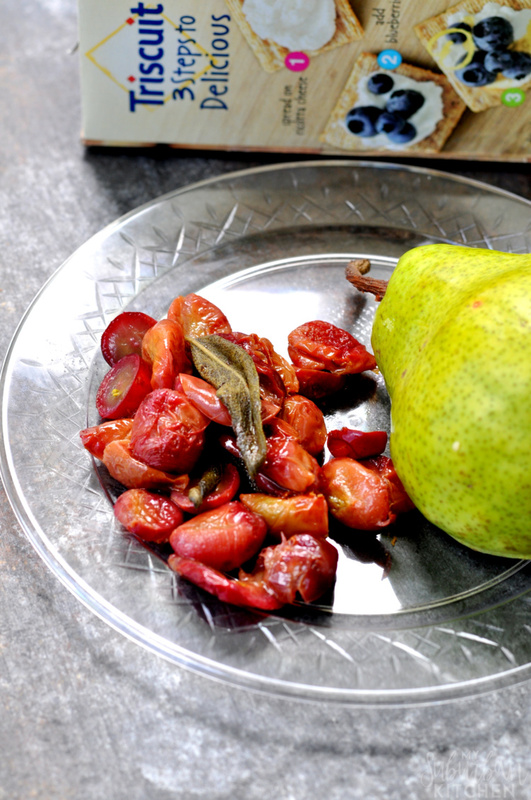 Roasted grapes – num!! Thanks much for bringing this by Throwback Thursday this week! !